Two disallowed tries ensured the Western Force ended their South African tour winless with the Sharks securing a 15-9 Super Rugby victory at Kings Park in Durban on Saturday (Sunday AEDT). The Force were looking to shake off the heart-breaking, last-second loss to the Bulls in Pretoria after controlling the majority of that contest and again they took it up to more fancied South African opponents. The Force led 6-0 at half-time with two penalties courtesy of Sias Ebersohn, but a disallowed try to Ben McCalman and then another in the second half to Steve Mafi proved match-deciding. The Sharks ran in two tries after the break courtesy of SP Marais and Lwazi Mvovo to secure the win despite the Force feeling as though they were the better performers. For coach Michael Foley it was another case of being proud of his team's performance, but disappointed with the result. "I thought the guys fought very well in the game and I thought they created a lot of opportunities. For that you've got to take your hat off to our blokes but at the same time we didn't finish the job off," Foley said. "It's a bit of an empty feeling when you think of how much rugby we played and the opportunities we created, but our guys kept pushing and I was pleased to see them do that." The Perth-based franchise has now lost six straight matches since scoring an opening-round victory against the defending champion NSW Waratahs in Sydney. In Durban, both teams missed early penalty attempts with Frans Steyn struggling with the kicking duties on goal and in general play in the absence of the rested No.10 Patrick Lambie. The Force appeared unlucky not to have a bigger lead at half-time when McCalman looked to have grounded the ball on the try line. With Force captain Sam Wykes joining winger Marcel Brache in being ruled out of the game due to concussion, the Sharks got on top in the second half starting with a try to Marais just minutes into the half. Then a stirring run returning a kick from Marais set up a try to Mvovo and that proved enough to win the game for the Sharks. However, the Force were again denied a try despite Mafi crossing the line. McCalman was ruled to have caused obstruction and that only added to the pain for the visitors. 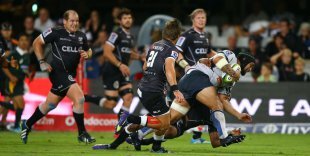 The Force have the bye next weekend before finishing the season with six of their last nine matches in Perth, starting against the Cheetahs on April 11. Captain Matt Hodgson is likely to return for the second half of the season and Foley is glad the worst of 2015 should now be over. "Any time you lose a game it's disappointing. There has been a lot of near misses this year and you feel very disappointed about that," Foley said.